Bright, contemporary villa which overlooks the shared pool. Very close to the beach and traditional local shops. Great for families. This 7 bedroom villa with swimming pool is located in Mykonos and sleeps 15 people. It has WiFi, parking nearby and air conditioning. The villa is near beach and walking distance away from restaurant. Wonderfully situated, traditional villa. Well-furnished and bright inside. Fantastic outside space with incredible views, very close to a sandy beach. This 16 bedroom villa with swimming pool is located in Mykonos and sleeps 34 people. It has WiFi, parking nearby and air conditioning. The villa is and walking distance away from beach and restaurant. 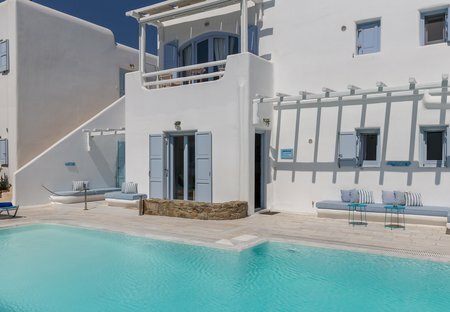 This 6 bedroom villa with swimming pool is located in Mykonos and sleeps 16 people. It has WiFi, parking nearby and air conditioning. The villa is and walking distance away from beach and restaurant. This 9 bedroom villa with swimming pool is located in Mykonos and sleeps 20 people. It has WiFi, parking nearby and air conditioning. The villa is and walking distance away from beach and restaurant. This 9 bedroom villa with swimming pool is located in Mykonos and sleeps 18 people. It has WiFi, parking nearby and air conditioning. The villa is and walking distance away from beach and restaurant. A stunning villa with heated infinity pool overlooking the Aegean Sea. Elegant, modern and eye-catching villa with private pool. Shaded pergolas. Stunning views. Only 600 m from Elia beach & three kilometres from Ano Mera village. Cycladic-style villa located just a few metres from fabulous sandy beach. Close to local eateries and shops; a short drive to Mykonos town. This 6 bedroom villa with private pool is located in Mykonos and sleeps 12 people. It has WiFi, a garden and barbeque facilities. This 12 bedroom villa with swimming pool is located in Mykonos and sleeps 24 people. It has WiFi, parking nearby and air conditioning. The villa is and walking distance away from beach and restaurant. This 5 bedroom villa with private pool is located in Mykonos and sleeps 10 people. It has WiFi, a garden and barbeque facilities. This 8 bedroom villa with swimming pool is located in Mykonos and sleeps 20 people. It has WiFi, parking nearby and air conditioning. The villa is and walking distance away from beach and restaurant. This 7 bedroom villa with private pool is located in Mykonos and sleeps 14 people. It has WiFi, a garden and barbeque facilities. This 8 bedroom villa with private pool is located in Mykonos and sleeps 16 people. It has WiFi, barbeque facilities and parking nearby. This 6 bedroom villa with private pool is located in Mykonos and sleeps 12 people. It has WiFi, barbeque facilities and parking nearby.